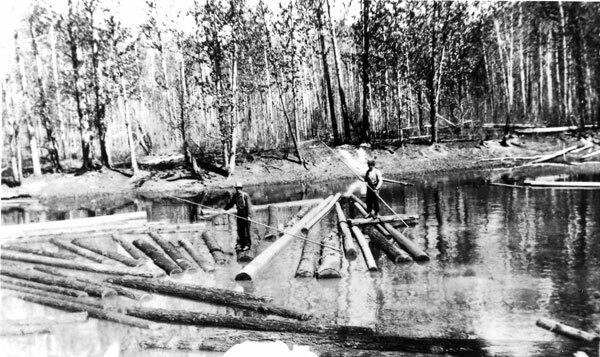 River driving, better known as log driving, was an important event for the forest industry of Enderby. 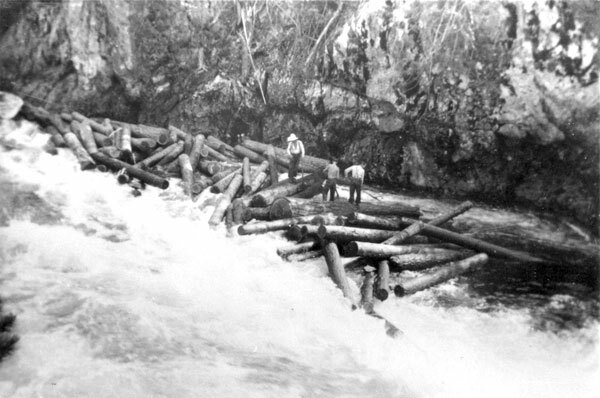 In the early 1900s, log driving on the Shuswap River was the only way to transport the logs to the mills; in later years it continued to be the most economical. Log driving required a great deal of time and strength to accomplish. The logs were driven from Sugar Lake or the Shuswap River into Mabel Lake, towed in booms to the mouth of the Shuswap River, and then driven down river to Enderby's large sawmill. Log driving was a very important and popular event that took place in and around Enderby. For a single drive, eight to ten men would leave their regular jobs and head to the river. For the next three to four weeks, the men participated in the dangerous yet exciting River Drives. They dealt with early mornings and dangerous tasks, along with enjoyable moments. During the first log drives, men worked ten to fourteen hour days at approximately $1.25 a day. Later, the days were shortened to eight hours, and the wages brought up to approximately $3.00 a day. It was a job that people like Rob Dale enjoyed doing. "It was a job where you had to trust your fellow workers, and you had to want to participate," stated Mr. Dale. The logs were cut and piled along the shores of Mabel Lake or the banks of the Shuswap River throughout the winter. When the river was judged to be at the right height, the logs began their journey down the windy Shuswap River. The types of wood used were cedar, fir, spruce, and larch. There were two different lengths: 12-20 foot logs which were used for building homes, and 30-60 foot lengths, known as poles, which were used for hydro-telephone poles. The poles, although the superior and the more expensive product, were much more difficult to drive. Their length made jamming up an experience faced many times through the log drive. Another difficulty the drivers or "River Hoggs" faced was bringing the logs through the Skookumchuck Rapids or "the Chucks" at Kingfisher. The depth of the river could also be a problem. In order to successfully bring the logs to the mills, the water's depth had to be perfect. If the water was too low, the logs would wedge into the bottom, yet if the water was too high, the fast current would wash them into fields along the side. Other factors that contributed to the difficulties were sloughs, backwater, and the wind, which was strong enough to push the logs upriver. Along with the difficulties came many great dangers. Although only one person was ever recorded drowning during log driving, the men took risks every day. The most dangerous of the tasks was log walking. Despite the fact that log rolling was not their strongest talent, the men had to jump from one log to another, pushing them down the river. According to Rob Dale, if a driver was caught falling in between or off the logs, he was considered a sissy or wimp. It was a job that the men took a lot of pride in doing. Some of the popular tools the men used to make work easier were the peavy and the pike pole. The pike pole was a simple tool with a wooden handle 14 feet long. The more useful of the two was the peavy, which was a long pole with a U-shaped metal device on the end, tipped with sharp spikes. This popular tool was used to stick into logs in order to turn them. It was also used by the men to keep their balance while on the logs. Later on, power saws and aluminum boats helped to lighten the work. 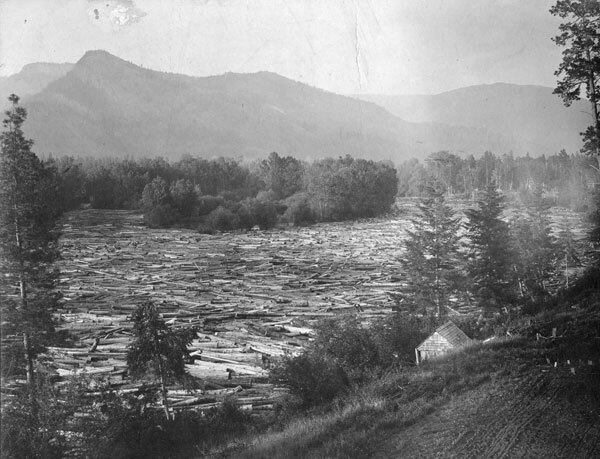 After the logs were driven down the river, they were either boomed in the river at Enderby or were brought to Mara Lake where they were boomed together and pulled to their destination by a tugboat. In order to get the logs out of the water, a Jackladder was used. This ladder had two rails for a cart which was pulled up and down by a heavily braided rope. Then the bark on the poles was removed by a simple axe. The last river drive on the Shuswap took place in 1967. In the years following, logging trucks were used to transport the logs to their destination, but the river drives have never been forgotten by those who participated in them. It took a lot of time and effort to accomplish the tasks that led up to the beautiful log homes and telephone poles.